I found this recipe in my Self magazine a few years ago. 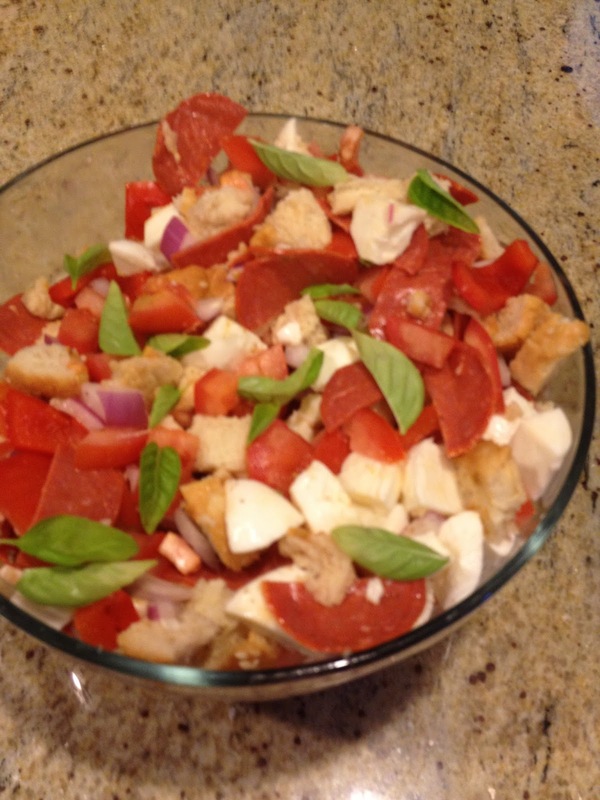 I'd never tried or seen anything like it, but love tomatoes, mozzarella, and basil together so we gave it a shot. It has since become a summer favorite. 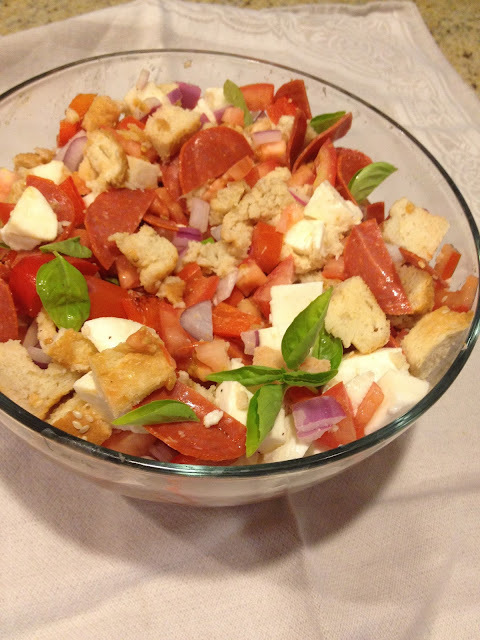 We grow fresh basil during the summer and it adds so much to the dish. Panzanella is really easy to make. Basically if you can chop you should be able to make it (I give no guarantees though). 1. Cube 4c. of bread, chop 2lbs of tomatoes, and 1/2 of a red onion. Combine in a large bowl. Pour 1/4c. chicken broth and 2T. balsamic vinegar and sprinkle 1/2t. salt and 1/4t. pepper over top. Stir to coat. 2. Add 8oz mini mozzarella balls or cubed fresh mozzarella, 1c. sliced roasted red pepper, and 4oz turkey pepperoni. Refrigerate for 1 hour. Add 1/4c. fresh basil and 1tsp. fresh thyme (although we use 1/2t. of dried thyme) before serving. 1. 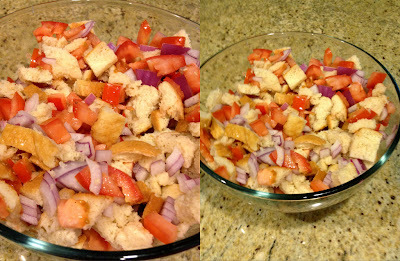 Stir bread, tomatoes, onion together. Add broth, vinegar, salt, and pepper, Stir together to coat. 2. 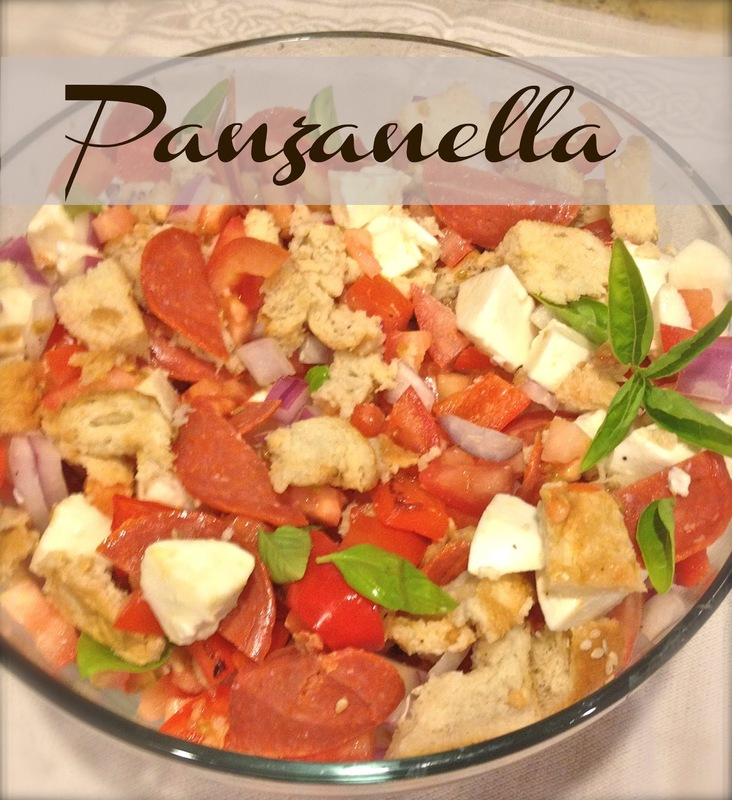 Add mozzarella, red pepper, and pepperoni. Stir to coat. Refrigerate for 1 hour. Add basil and thyme before serving. Yum! What a delicious meal! Thank you! It's so easy and I love all the flavors together. Fresh basil and mozzarella make everything taste good!